I’ll be doing more regular blog posts on marketing and promotion tips for authors, called ‘Marketing Mondays’. It won’t necessarily be every Monday, just whenever I’m able to. I’ll be discussing such topics as twitter, facebook, email newsletters, copywriting, blogging, and general tips. If there’s a topic you’d like me to cover, let me know! To read my popular post ‘10 Marketing Tips For Authors – From A Business Perspective’, please click here. Today I’m talking about Twitter Basics for Authors (although it might be helpful to some non-authors too). I’ve heard from a lot of authors recently that they don’t really get twitter, or they’ve signed up for an account but haven’t used it yet because they’re not quite sure what to do. I hope this article will help demystify the Twitterverse for you! >What on earth is Twitter and what is it for? Twitter is a form of interactive social media, it’s an ongoing public conversation, and a way to interact with others, learn, discover, chat about a certain topic, and have fun. Public is the key word. Unless you set your tweets (short messages or updates) to private, your tweets can be seen by potentially anyone, regardless of whether they’re following you, so remember to think before you tweet! For authors, it can be a way to meet and interact with other authors, publishers and editors, agents, and readers. There are even pitching competitions on twitter where you could get the chance to submit your manuscript to an industry professional. It can be a useful marketing tool, but must not be used purely for this or you will be seen as a spammer and people will unfollow you. 2. Fill in the sign-up form with your name, email, and password. 3. On the next page you’ll be instructed to choose a username. This is the ‘twitter handle’ people will use to connect with you. Make it something easy to spell and remember (eg: mine is @Juliet_Madison) It can be the same or different to your name. (*Note, both your name and username will be visible publically, so use your pen name if you don’t want your real name showing up). 4. On the next page, click next, follow the instructions and ‘follow’ five people to get started. If you don’t know who to follow, follow me! (type @Juliet_Madison into the search field). You can also search for words like ‘writers’, ‘authors’, ‘publishers’…etc to find people in those fields, or search for your favourite authors, then click ‘follow’ next to their name. Once you’ve followed five, click next. 5. Twitter will ask you to follow another five, and will give you suggestions in different categories. Choose another five people then click next. 6. It will now give you an option to add people from your email contacts list, but if you like, just skip this for now by clicking on ‘skip’ (it’s written in light grey font and a little hard to see, but is just below the listing of email contacts). 7. Upload a photo and write a brief bio about yourself (see maximising your profile, below). You can change this later, so if you’re not sure exactly what to write, just put ‘writer of *insert genre*’ for now, and click done to move to the next page. The next page is what you will see each time you log into twitter – a ‘stream’ of tweets from people you are following – and you are now ready to tweet! Or you can take some time to follow more people and/or maximise your profile first. Also, go to your email account at this point and confirm your account, as twitter would have sent you an email. 1. Click on your name to view your profile. This is how it will look to others. 2. Click ‘edit profile’ and adjust your bio if needed. Also click on the words ‘location’ and ‘website’ to add them. What to write in your bio? At the very least, tell people your occupation (ie, writer or author), the genre you write in, and any other detail you really want people to know about you. Some people’s bio’s are quite humorous! But they don’t have to be. Think about what you want out of twitter, and tailor your bio to suit. If you have a blog or website, you definitely need to add that as it will help you get more visits to your site. – Add hashtags (more on them later in this post). Hashtags are words starting with #. If you write romance, you could add #romance to your bio. Then people searching for romance will more easily find you. 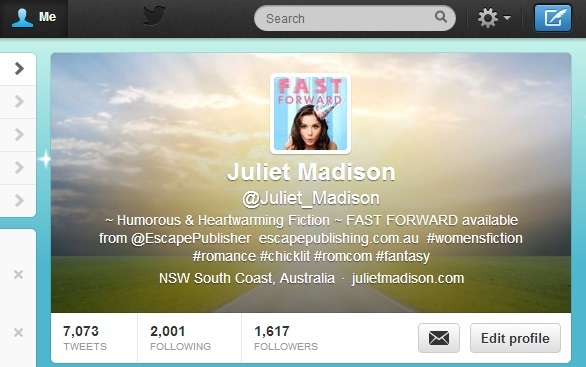 – If you’re published, add your publisher’s twitter handle (eg: mine is @escapepublisher). When people are searching for that publisher, your twitter profile will show up in search results. So many authors fail to do this, but it can be a good way to give yourself extra exposure, and it also tells people visiting your profile who you’re published with. – change your profile occasionally to coincide with promotions or new releases. For example, you could say: ‘Author of Fantastic Book, available now at Amazon: *amazon link*’, or: ‘Win prizes in the Fantastic Book blog tour! Details here: *blog link*’, or: ‘Get a free ebook when you subscribe to my newsletter at *insert link*’. Think of it as a call to action – what do you want visitors to your profile to do? The first thing is of course, you want them to follow you. The next would be to visit your site or buy your book, or add it to their wish list. Make it easy for them by including direct links and mentioning any benefits. 3. (Optional) Add a header photo. If you just want to get on with tweeting for now then leave this till later, otherwise click ‘edit profile’ again and then click the little pencil icon in the top corner of the larger header picture (not your profile picture). Add a photo. You can resize this by dragging the little button. You can also change your background picture/design by clicking the little cog wheel at the top of the page and selecting ‘settings’, then ‘design’. Now try following more people. Search for people you know, your favourite authors, publishers, bloggers…etc. Some of them might follow you back, and you will get notified when this happens. Twitter can put limits on how many people you follow, so don’t go overboard at first, you can follow more people gradually as you start interacting with others. You might also like to post an update on Facebook (if you’re on there) to tell your friends that you have a new twitter account and need some followers. 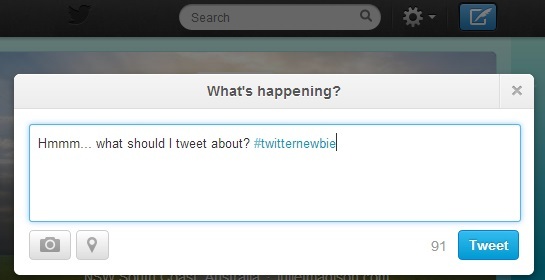 >How and What to tweet? Tweets are short messages or updates, limited to 140 characters. 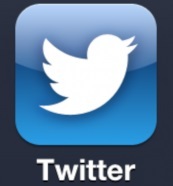 To tweet, click the little blue square icon in the top right of the page. This opens up a tweet window where you can type in your message and click ‘tweet’ when you’re ready to send it out into the world. Remember what I said before about it being public. You can delete tweets, but nothing is ever completely deleted from the internet. Got nothing to say? Of course you do, you’re a writer! And believe me, you could soon find yourself spending too much time on twitter and wishing you hadn’t read my blog post and started your addiction! To start with, see what others are tweeting. You can also see my tweet stream on the side of this blog (unless you’re on a smartphone) or go to http://www.twitter.com/juliet_madison and take a look. You can also add a ‘hashtag’ to a tweet. This is a word or phrase starting with the hash symbol #. This will add a hyperlink that people can click on, which will take them to a page containing all the tweets that have also added that particular hashtag. It’s a great way to communicate with people about a particular topic, and is also a way to find new people to follow that share your interests. For writers, it can help with promoting your work. For example, if you write chick lit and add #chicklit to a tweet, people searching for that hashtag can find your tweet. You can also find other writers by using the hashtags #amwriting, #writing #amediting #writetip #pubtip to name a few. When you reply to a tweet, you are ‘mentioning’ someone. This means their twitter handle will be included along with your reply, and they will get notified that you mentioned them, so they may continue the conversation if they wish. You can also just mention someone outright, without replying to a tweet. To do this, include the person’s twitter handle in your tweet. You can mention anyone, even if they’re not following you (including celebrities), but be careful not to annoy anyone by over-mentioning them! If you come across a tweet you particularly like, you can retweet it by clicking ‘retweet’ when you hover your cursor over the tweet. This means you are sharing this tweet with your own followers. People often appreciate retweets, because it means their message is getting seen by more people, and don’t be surprised if you get a thank you tweet in response. Be careful not to ‘over retweet’ though. If your tweets are mostly retweets, people will tend to unfollow you because you yourself are not interacting, just using other people’s tweets as your own. Another thing to do if you see a tweet you like, or if you come across a tweet you want to remember for later, is to click on ‘favorite’, which is next to the retweet option. This will save the tweet to a list of favorites which you can access by clicking on your profile page. The person’s tweet you are favoriting will also be notified. Favorites can be seen as the equivalent of the ‘like’ option on Facebook – a way of acknowledging something without replying to it. The envelope icon on your profile page allows you to send private messages to people, but only if they also follow you. Don’t use this to promote your books, it will be considered spam. Use it when you want a more private discussion with someone you’ve been interacting with, or to pass on email addresses for further communication…etc. Interaction is your first priority, promotion is your second. There’s a reason it’s called social media. Don’t overuse it – allocate time to spend on twitter, otherwise hours can pass, and the tweet stream never ends!! Twitter is going 24/7. If you’ve enjoyed a book, mention the author and tell them. What goes around comes around. Don’t use it as your only form of promotion. Twitter is only one type of social media, and social media is only one part of a marketing campaign. If someone compliments you or your books, thank them by favoriting the tweet, retweeting, or replying. Favoriting only takes a second, and lets them know you appreciate it. Be consistent. The tweet stream flows quickly, and you get the most out of twitter when you use it regularly, rather than just a couple of tweets every couple of weeks or so. There are programs available that allow you to schedule tweets in advance, such as Hootsuite and Tweetdeck, but I won’t discuss them here today, however, feel free to Google them if you’re looking for that type of feature to add to your twitter account. 3. Reply to tweets, retweet tweets, and favorite tweets. You’ll progress naturally as you get more followers and get used to using it. 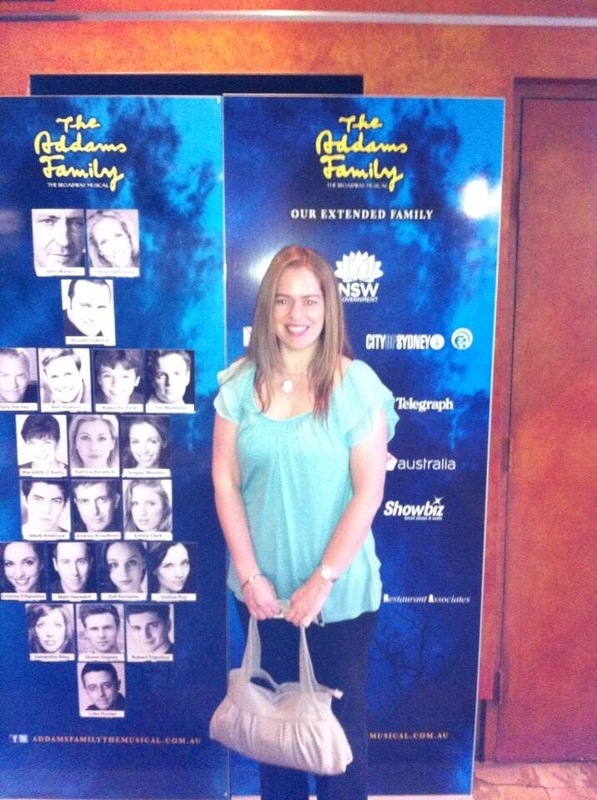 Me at The Addams Family musical in Sydney, after scoring two free tickets via Twitter. Juliet Madison is a naturopath-turned-author with experience and training in running both an online and offline business. She won Marketer of the Year in 2008 in her industry, and enjoys educating others on ways to maximise their marketing.